August 2012 I attended a writing workshop titled “Making a Personal Metaphor from the Natural World” by the writer Matt Love at the Alder Creek Farm Conservation Site in Manzanita, Oregon. 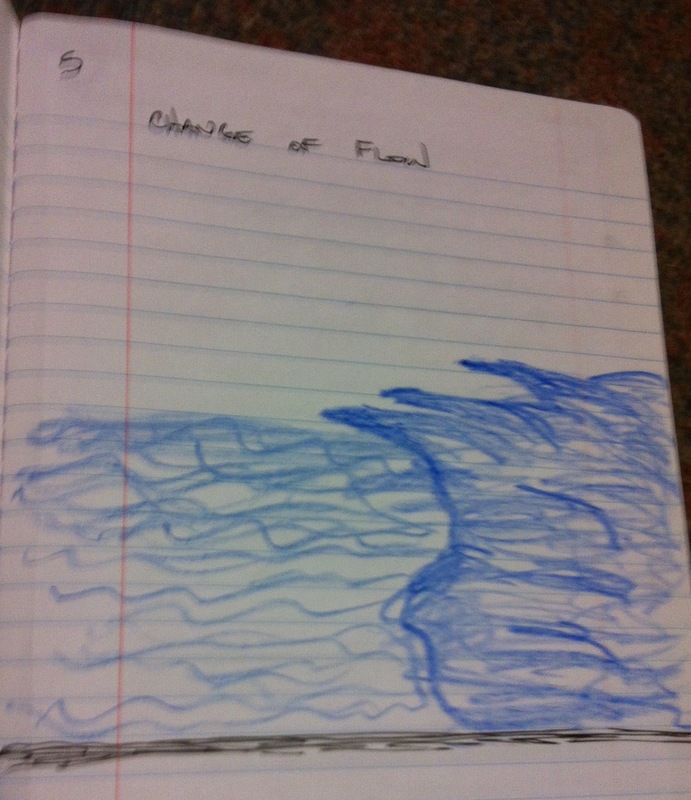 Another of Matt’s prompts that day – was to use different blue crayons and draw a body of water resembling self. My crude picture was a side view of a river meeting the ocean (I was thinking about the mouth of the Columbia River colliding with the Pacific Ocean between Washington and Oregon). – The next step was to write some thoughts about our sketch. I am at a point in my life where, like the mouth of a river meeting the ocean, flow has changed. No longer going in a predictable direction, now part of a more random, changing… Freedom. The largely wilder side of uncertainty is both calming and stressful, at the same time. This change of flow is unique in its position of looking into the future, while looking backward. The gravitational nature of this place in uncontrolled. – Next we were to go back and underline the top three words. – Then write a sentence summarizing our thoughts.